And now for my project! Every year I make a fun Christmas bag for my niece. This is what I made for her this year. I also used Jaded Blossom's Flag Dies, Elegant Holiday Greetings and Winter Dies. 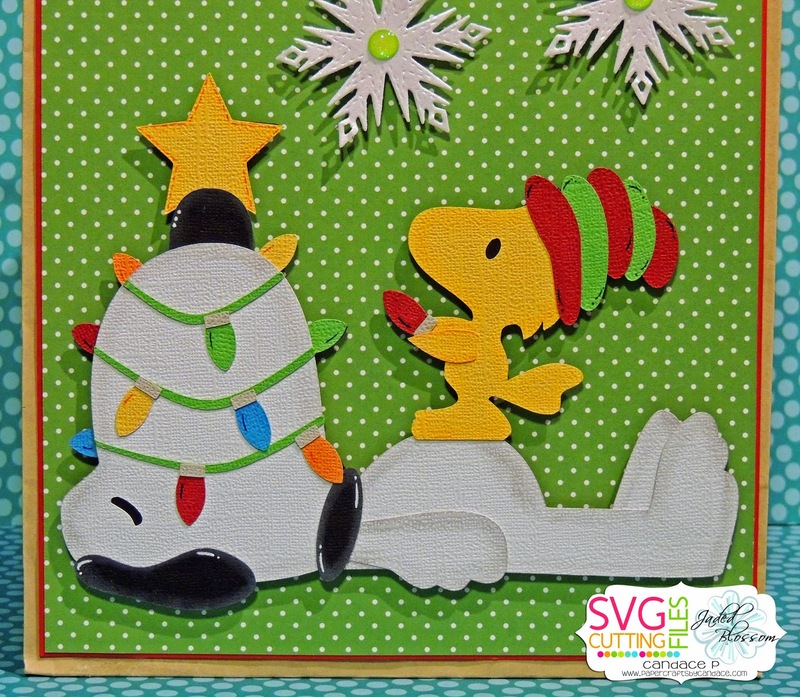 Here is a close up of Snoopy and Woodstock! My favorite scene. Thanks for the sweet project and blogs. What a wonderful idea! Very cute. LOL - love this. Great job. love everything about this card. So very cute -- love Snoopy & Woodstock!! Just the best. Love your work!!! LOL! Too cute! Great gift bag. You did it again, this is fantastic! I think the Snoopy tree is a great idea. Love this hop. Peanuts and Christmas, what a mixture. What a cute way to rev up plain paper bags I even see reusing Grocery Bags for my big items and just resizing the svgs!! This made me giggle!!! Super cute bag! Hehehe! Not that Snoopy ever says much, but what a great way to keep his mouth shut. Lol! Love it! So glad I did this hop! great project! Oh My! I love your project. Just too darn cute. Awesome. I can't wait to make these. This is one of my favs. Fabulous hop. Love this for the upcoming holiday. What a cute idea. Oh Woodstock what a character. lol. LOVE your ADORABLE gift bag. Thanks for sharing. Oh my crafty goodness this is awesome. Great ending to a hop that started great too. a classic scene with woodstock and snoopy - very very cute! Oh my gosh. I totally love this. All my Christmas Cards are going to be Charlie Brown ones this year. I love it great project. That is just awesome! Love it! This is AWESOME!!! Love that scene on the bag and the snowflakes look amazing! Lovely treat bag! This is wonderful! OMG!! Now THAT is cute!! This has been fun! I am certainly glad that I do not have to pick a favorite ... each and every project was AWESOME!! This is fantastic! Love this whole hop! Thank you so very much! i totally love decorating bags for christmas. it is sooo much fun. this is a very cute one that you made! love it. poor snoopys nose hehe. love it!!! snowflakes to the Christmas lights!! every little detail just make this a truly Fabulous project! OMG - This is so cute!! It just doesn't get any cuter. So creative! Love the Snoopy and Woodstock. Just adorable. And so many memories from childhood. BIG smile for this one! This one made me giggle. Love it!!! LOVE the lights on the nose! I love the little details, like on the lights! Love this. OMG this is adorable! I especially love the lights around snoopy's face! Cute, cute, cute! This is fantastic!!!!! Love it!!! How cute are Snoopy and Woodstock, with the little light in his hand. This hop made my friday! Ha ha ha! What a great gift bag idea. Great job on the project. The shading of Snoopy makes him pop. LOL!!! This hits home with our fur kids. LOVE IT!!! What a cute idea for my granddaughter (preschool) to bring to her teacher with a Christmas gift inside. Omg this is absolutely cute! nice job! Oh my, this is my favorite of all! This one is my fav... great job! This is great! I might have to put this one in a frame to display. OMG!!! This is stunning!!!!!! Love it!!!! Absolutely adorable! I think this might be my favorite! This has been such an amazing hop. So many great projects. This one is definitely one of my favorites. How cute is this gift bag! I need to get those snowflake dies. ACK! Absolutely in love with this! FABULOUS!!! What an addable gift bag. LOVE IT!! love it! thank you for sharing..
Love all the projects! !Thanks for sharing with us!!! This is an awesome card, love the colors. I love your card. What a great hop! Thanks. Talk about saving some money! I love this! Love this one of snoopy! So cute! What a great way to dress up an otherwise plain brown paper bag! Love it! Snoopy makes a great tree! great job! Love this! The lights on his nose!! Thanks for sharing all these awesome files! Love all of them! I think your Snoopy and Woodstock bag would make a great Christmas card. how stinkin cute is this? love it! So cute! The snowflakes add a lot. This is amazing. I have to make this. So many wonderful projects, but I always favored laying down Snoopy with his good pal Woodstock on his round little belly! Wonderful job! Merry Christmas Charlie Brown! 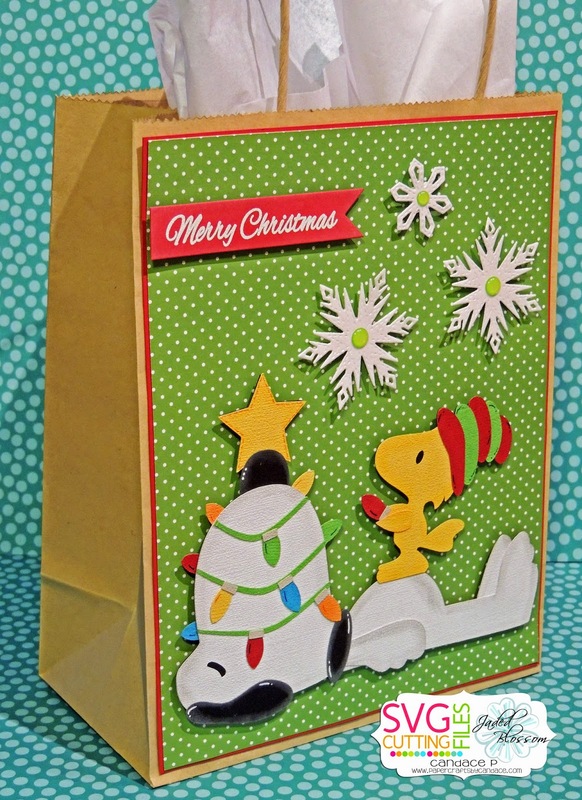 What a great way to re-cycle & reuse paper bags that with the most Adorable Snoopy & Woodstock scene ever. Love the Snoopy snout light bulb tree, great choice of bright colored polka dot background paper, it creates a festive mood. Wonderful project and creatively crafted. I LOVE this, too cute!! Oh my gosh this is my favorite!!! So adorable! This is super adorable! I think that it is my favorite. What a wonderful gift bag! Love Snoopy as a Christmas tree.....Lol! Oh! What a beautiful bag. Love it!! Your gift bag is so adorable! I love it!! The snoopy tree made me giggle, so cute!! Now this is adorable. Love It!!! love this cute gift bag! Perfect project! I love this one- the detail on the lights is amazing!! What a great job. Thank you! What a great gift bag. LOL, no tree, Snoopys nose, cute! !